Please Note: Not to be shared with dogs! 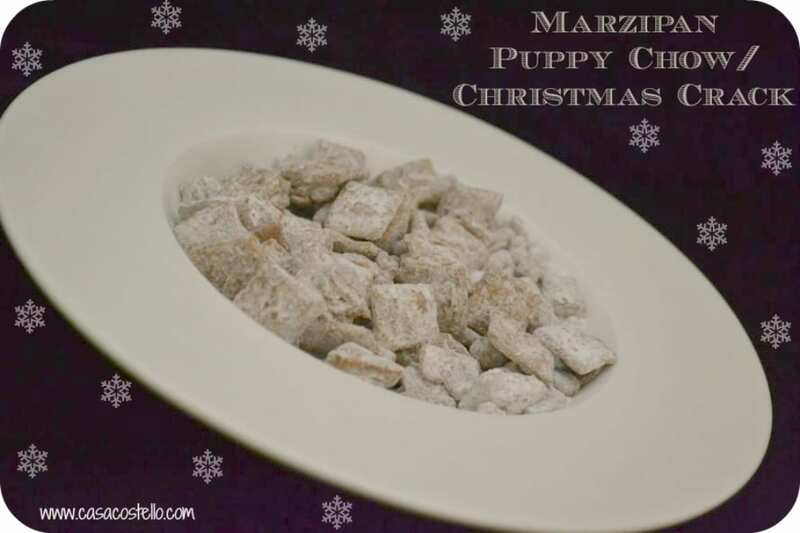 I have no idea why this sort of snack is called Puppy Chow – All I know is that it is delicious and very addictive. I have numerous combinations of Puppy Chow – The original version should contain peanut butter but I much prefer my almond version. Perfect for when you have guests over Christmas but make sure you make double! The idea for puppy chow originates in the US and uses Chex cereal – These look like Shreddies but are not malted. I find that Golden Grahams taste just right. There is no need to be exact in your weighing of the ingredients – This recipe is meant to be fun, quick and easy and different with every delightful mouthful! Melt in the Mouth Churros from Truly Madly Kids. I’ve made Churros and know how hard they can be to keep their shape so massive well done! Slow Cooked Beef in Red Wine Sauce from Dragons and Fairy Dust. Cor! How inviting does this look?